So how does a smart home actually work and how do you go about having a smart home system installed? 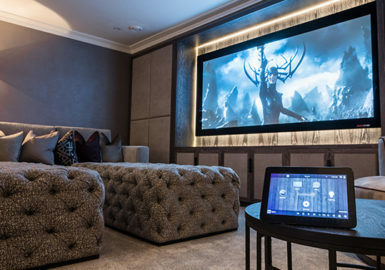 The beginning of any smart home journey should start with a consultation with a CEDIA certified smart home designer or installer. An initial consultation will explore what you want to achieve, your home’s scale and layout and how your family uses your home. These initial consultations will determine which systems and functions will benefit you most and provide the best value for your investment. Initial consultations will be followed up with detailed proposals and prices alongside a demonstration of the systems. Once a system is agreed upon, the installer will produce a detailed plan showing exactly what the finished system will do. You’ll also be able to see all the equipment that’s needed and whether any other trades need to be consulted. Most smart home systems need to be installed during major refurbishments or as part of a new build home. This is because of the future-proof wiring infrastructure that is the foundation of a smart home. Whilst systems can be installed wirelessly, it limits quality and reliability. Wireless installation should only be considered as a complementary technology for internet use and controller apps. A star wiring system will most likely be used. This involves running a mixture of data, AV and control cables from a central location in the house. It will ultimately house all of the audiovisual and smart home control equipment in a dedicated equipment rack. Some systems, like gate or door entry, will typically be supplied and installed by the smart home installer. However other systems must be verified and wired into the smart system. Third party systems must be able to function independently and their operation must be signed off as complete before it’s integrated into your smart home. When a house approaches the time when switches and sockets are installed, your installer should have engineers onsite to fit sockets and central panels and to test and verify all of the cablings. During this time your installer should be building, wiring and testing the central equipment racks so a fully operational system can be demonstrated before installation. When your house is nearly complete, the smart home hardware should be installed and the equipment rack will be delivered and installed. Upon completion full technical instructions and guidance will be provided in writing and verbally and the free service period of typically 6-12 months will begin.